Independent School District’s Student of the Month for March, presented by the Bullard Rotary Club, has been named Minta Spears. Spears, a senior at Bullard High School, is the daughter Sandy and Randy Spears. She has one brother, Zac. She is a member of the National Honor Society, the Fellowship of Christian Athletes, National Forensics League, and the Model United Nations. In addition to her club involvement, she has participated basketball for four years, cross country, for two years, and track for two years. She was All-State in TABC and TGCA for three years, All-region for four years, District MVP for four years, All East Texas Newcomer of the Year, All East Texas First Team for two years, Academic All District, Region and State, in basketball. She was a state qualifier in 2008 and won Academic All State in cross country. In track, she was a regional qualifier in the mile, two mile, mile relay, triple jump and long jump in 2009. She was a regional qualifier in the 800 meter run in 2010 and also won Academic All State. 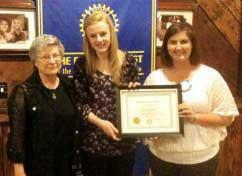 She was the Kiwanis Sophomore of the year in 2010, is the NHS treasurer, and the FCA secretary. Her hobbies are being a church member at FBC Bullard, participating in theater and debate.